What Does the Medieval Night Sky Tell Us about God? In Charlemagne’s day (748-814), astronomy was a blend of natural philosophy and religion, a study of the creation—and the creator. Medieval people saw God’s hand in everything, from providing a good harvest to feed them through winter to healing the sick to deciding the victor of the war. So they would do what they could to gain God’s favor. Three days of litanies were part of the military strategy. In the medieval mind, searching the night sky for clues to God’s will made sense. The universe had to be orderly, and Carolingians relied on Roman books to explain it: Pliny’s Natural History, Macrobius’s Commentary on the Dream of Scipio, Martianus Capella’s Marriage of Philology and Mercury, and Calcidius’s Commentary on Plato’s Timaeus. Early medieval intellectuals placed Earth at the center of the universe and the sun, moon, and seven planets revolving around it in eccentric patterns—that is, circles within each other but not sharing the same center—and at different angles to the Earth’s plane. Planets, the keepers of God’s time, could also move in epicycles, loops along a circle. King Charles himself took a keen interest in astronomy and corresponded with scholars about phenomena such as eclipses and the size of the moon. His biographer Einhard elaborates, “He learned how to calculate and with great diligence and curiosity investigated the course of the stars.” Charles passed on his interest in astronomy, along with the six other liberal arts, to his children, both sons and daughters. In a poem, the scholar Alcuin mentions a daughter gazing at the night sky and praising God, who created it. The pursuit of knowledge fit into Charles’s imperial ambitions. In 780, he recruited foreign intellectuals, and in the decade that followed, workers were converting the royal villa at Aachen to a palace, one of many construction projects Charles would undertake. Astronomical events were important enough to record in the annals. The year 810 saw two eclipses of the sun and the moon, and 812 had a midday eclipse of the sun. To Einhard, those eclipses, spots on the sun lasting seven days, and a ball of brilliant fire that fell from the sky during a war were among the signs that Charles was near the end of his life. Einhard says Charles ignored the omens. Perhaps the emperor decided not to make a big deal of them publicly. But a year after that last eclipse, the 65-year-old monarch in declining health appeared to be putting his affairs in order. He invited his son Louis, the king of Aquitaine, to the assembly in Aachen, placed a crown on Louis’s head, and named him co-emperor. Charles also ordered that his grandson Bernard be called king of Italy, succeeding Louis’s late brother. A few months after the assembly, a high fever and pleurisy sent Charles to his bed. He died a week later on January 28, 814. The annals say nothing about the sky that night. This post was originally published July 27, 2016, on Unusual Historicals. Astronomy? Astrology? No Difference in the Dark Ages. I hope my post on Unusual Historicals won’t drive my scientifically minded friends too crazy. I’m using the term astronomy to describe a natural philosophy closer to today’s astrology. But early medieval scholars called their study of the universe astronomy. They saw similar phenomena as today’s stargazers do—eclipses, comets, planets, constellations—but it was for a different purpose. Well, sort of. Astronomers throughout the ages sought explanations for their observations. Today’s scientists look at forces such as gravity. In the Middle Ages, scholars were trying to figure out Gods’ will and believed unusual events in the sky were omens. See my post for more on how Carolingians saw the universe. Ninth century diagrams show the division of the day and the week (public domain, via Wikimedia Commons). Did Gifted Scientist’s Belief in Atoms Lead to His Obscurity? It’s the first Friday of the month, time for another post on the history of atom theory by physics professor (and my dad) Dean Zollman. Here, we’re in 17th England, and we’re introduced to Thomas Harriot, an explorer with a gift for astronomy, physics, and mathematics. Yet he is little known today. In 17th century England, science was making important strides in a many areas. Most people might not think of the development of the ideas of atoms has a major area for progress at that time, but progress was made. Further, ideas about atoms influenced other areas and people as well. As I was thinking about this post, I was trying to decide whether to begin the discussion of this era with Robert Boyle or Isaac Newton. Then I discovered a little known scientist and mathematician, Thomas Harriot (also sometimes spelled Harriott, Hariot, or Heriot). Harriot (ca. 1560-1620) made significant discoveries in exploring the New World, astronomy, optics, and mathematics. He believed in the existence of atoms. As I will discuss, this belief may be the reason for our lack of knowledge about him today. A portrait believed to be Thomas Harriot by an unknown artist. While they were traveling, Raleigh asked Harriot to think about the most efficient way to stack cannon balls on the deck of a ship. Harriot came up with the pyramid shape that was used until cannon balls became obsolete. Today, this stacking method is used in most pirate movies. Harriot later applied this way of packing objects to the way atoms would arrange themselves inside a material. Upon return from America, Rayleigh introduced Harriot to the Henry Percy, the ninth earl of Northumberland. Apparently, the earl liked to have smart people to hang out with. He put Harriot, and a couple of others, on a salary. Harriot’s primary duties seemed to be to think and talk with Lord Henry. 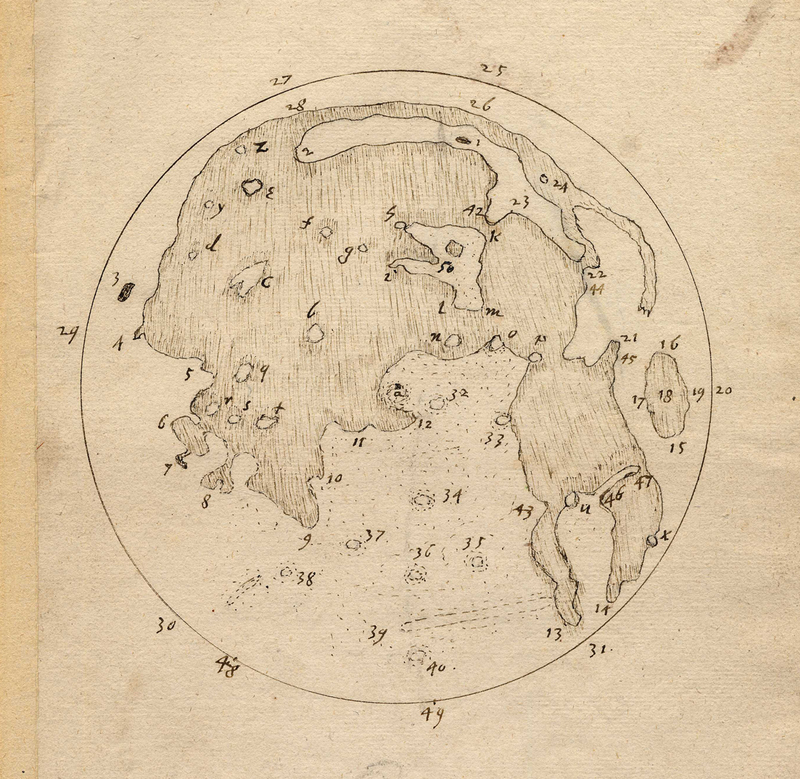 Thomas Harriot’s sketch of the moon, early 17th century. When Harriot became interested in astronomy, he obtained the newly invented telescope and started looking at the moon. Several months before Galileo published his observations, Harriot sketched the surface of the moon. Those sketches still exist today. However, Harriot never published them, so today Galileo gets the credit. Harriot’s contributions in mathematics are mostly in algebra. His work on using simplified symbols in algebra, and his theory of equations are considered to be way ahead of others of his time. This work was published in Latin after his death. However, Artis analyticae praxis contained many editing errors and omissions. A complete and correct translation was not published until the 21st century. As early as 1685, Rene Descartes was accused of plagiarizing Harriot in his discussion of algebra. However, today most historians discount this idea. Harriot apparently also discovered experimentally the law which describes how light bends when it goes from one transparent medium to another. Twenty years later, Willebrord Snellius published the same idea, so the principle is now known as Snell’s Law. In between Harriot and Snell, Descartes also discovered this principle. However, it was first published in 984 by Ibn Sahl of Baghdad. The bending of light leads us back to Harriot’s thoughts about atoms. Some of Harriot’s study of light had been motivated by an October 2, 1606, letter from Johannes Kepler. 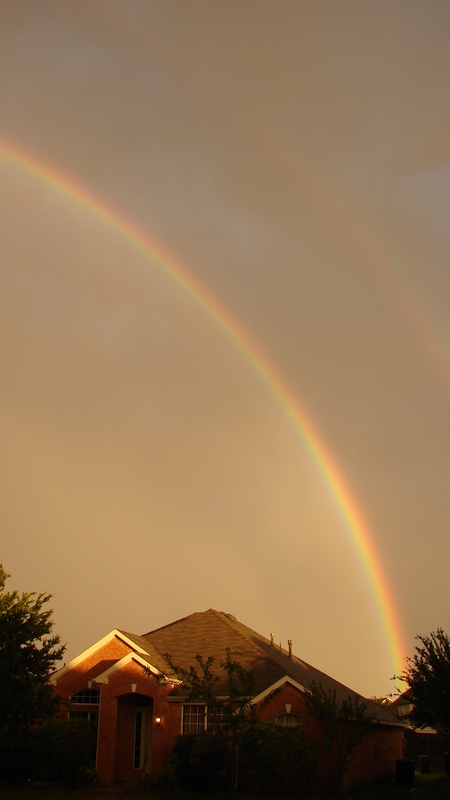 Kepler was having difficulty developing a theory for rainbows and asked Harriot for advice. With so many accomplishments, Harriot published during his lifetime only the report on Virginia. Some historians claim that life was just too easy of him. He had an income for life from the earl of Northumberland. Unlike modern scientists, he never needed to compete for research grants, so he did not need to build a reputation. Others wonder if he was too sickly or too disorganized. Another hypothesis lies in Harriot’s support of atoms. In the 17th century, the intellectual community did not separate the science of the ancient philosophers from their philosophy. As described by the Greeks, atoms were neither created nor destroyed. Because these atoms were the fundamental constituents of everything, there was no need for Creation; in fact, no need for gods. For many in the 17th century, a belief in atoms was equated to being an atheist. And atheism was a serious crime. 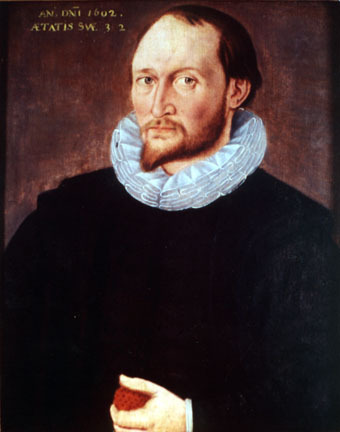 So, perhaps Thomas Harriot did not want to bring attention on himself and his beliefs, particularly related to atoms, by publishing his discoveries and conclusions. For the past two (maybe three) posts, I have focused on a rather obscure event or person related to the history of atoms. Next time I will try to get back the mainstream, unless of course I get distracted again by a character as interesting as Thomas Harriot. Images in the public domain or used under the terms of GNU Free Documentation License, via Wikimedia Commons.